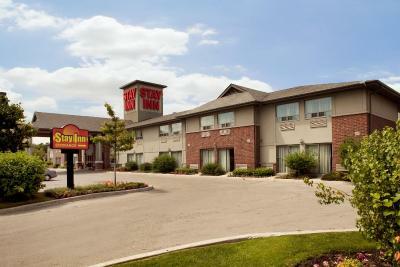 Lock in a great price for Stay Inn Hotel Toronto – rated 8.1 by recent guests! Staff at the reception desk ( Mr. Junaid ) was quite friendly and cooperative. Good location, staffs are very friendly and helpful. We have stayed here a few times and our visit is always good. The room is clean and quiet (until the heater comes on - it is a little noisy), and the bed is comfortable enough (nothing is as good as home!). Breakfast is fine - the coffee is hot, and they provide peanut butter for the bagels (good for us vegans). The staff is always pleasant and helpful, so good value for the money! Close to Toronto but less expensive than hotels downtown. Free parking and free breakfast which was delicious! Great place to stay! The location was close enough to the city but out of the way enough to relax. Lots of restaurants and shopping malls nearby. The room was spacious and comfortable. For 19$ CAD they deliver wine and chocolate to your room. Breakfast was great and the staff was friendly. Room was a great deal! ALSO: Just a heads up, they did make me pay a $100.00 deposit at check in. Not sure if it was because I was using a card from the US or what but it's good to know in case you are paying with a debit card. Liked the location for our needs; not too busy traffic, etc. Easy to get around. Stay Inn Hotel Toronto This rating is a reflection of how the property compares to the industry standard when it comes to price, facilities and services available. It's based on a self-evaluation by the property. Use this rating to help choose your stay! One of our top picks in Toronto.This Etobicoke hotel is within a 15-minute drive of Pearson International Airport. The hotel offers free Wi-Fi, free on-site parking and a daily breakfast with hot and cold items. Stay Inn Hotel Toronto features a 42-inch flat-screen cable TV with 2 movie channels in every guest room. Rooms are also equipped with a fridge and work desk. Free local and long distance calling is available from each room. Coffee and tea service is available 24 hours day at the Stay Inn Hotel Toronto. Additional hotel amenities include laundry facilities and a 24-hour reception. 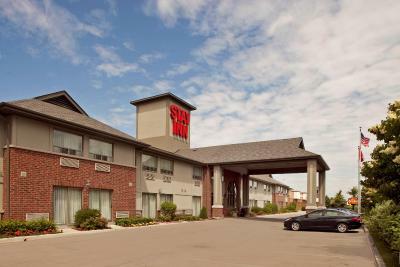 Downtown Toronto is within a 20 minutes' drive, while Canada's Wonderland theme park is a 25 minutes' drive of the Stay Inn near Pearson International Airport. The Sherway Gardens Shopping Center is about 1.2 mi away. Etobicoke is a great choice for travelers interested in sightseeing, entertainment and shopping. This property is also rated for the best value in Toronto! Guests are getting more for their money when compared to other properties in this city. When would you like to stay at Stay Inn Hotel Toronto? This room features a 42-inch flat-screen cable TV, free Wi-Fi, and a fridge. House Rules Stay Inn Hotel Toronto takes special requests – add in the next step! Free! One child under 4 years stays free of charge in a crib. Stay Inn Hotel Toronto accepts these cards and reserves the right to temporarily hold an amount prior to arrival. Upon check in, photo identification and a credit card are required. All special requests are subject to availability upon check-in. Special requests cannot be guaranteed and may incur additional charges. Breakfast is good and location excellent and TV quality superb. staff left the phone rinning. Hung up on me after 15 minutes on ring. left the phone off the hook after answering the second time I attempted to call. Closeness to the places we needed to go. The noise from down stairs bothers our sleep. ☹ and no elevator for heavy bags. What a pleasant surprise! Just the perfect spot for my business trip Toronto. So much better than staying right downtown and so much more affordable! Free parking, breakfast, large rooms, great shower, very nice toiletries. No pool and there was stairs to carry luggage but I managed for my short stay. our room was badly located - right above the main entrance doors of the hotel so there was constant noise especially as it was winter and all the smokers gathered there and their voices could be clearly heard via the a/c grill. We have stayed at this hotel before and never been in this room, and will certainly request not to be next time. Everything, breakfast, staff, etc., as always was great. Lack of a coffee maker was irritating, but not insurmountable. The cleanliness of the room was outstanding and the location was very convenient. The little breakfast area provided the basics which on most days was enough.